By Laura Larkin | October 7, 2014. 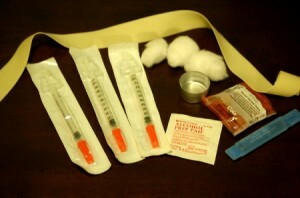 Contents of a needle exchange pack. Photo: Todd Huffman via Flickr cc. Bodybuilders who are hell-bent on looking buff are using Dublin’s largest needle exchange to ensure that their needles are clean. The Geordie Shore effect is driving men to take extreme action to bulk up and they are using services designed for street-drug users. Merchant’s Quay Ireland (MQI) has noticed a surge in illegal steroid users visiting their needle exchange, a new trend that they say comes down to an emerging focus on looking good. Around 10 percent of the exchange’s clients are swapping needles to inject steroids according to CEO of the group Tony Geoghegan. “It means that more than 300 people are coming in for this reason,” he said. The steroid users that are dropping into the Riverbank centre are all men, of various ages. “It’s the body-building epidemic,” he said, describing many of the new breed of needle users as, ‘guys with big biceps’. Those seeking clean needles for injecting steroids fall into two groups according to the CEO. The first are men who are focused on their body, they don’t use any other drugs and their steroid use is simply to emulate the buff look popularised by reality shows. “There is one group who don’t use any other drugs at all and are very into toning and looking good and having the right body shape,” he explained. The second according to the charity are regular drug users who hope that the steroids will conceal signs of their drug use and make them look healthier. “This is definitely a new phenomenon and more research into how to help those who are using steroids needs to be prioritised,” he explained. “We know how to help heroin addicts, but we know very little about this new trend,” he added. “We don’t know the long term effects of steroid use, or what information we can be giving people to reduce the harm,” he continued. “It most likely all comes back to self esteem and confidence issues, as pressures on men increase,” he said. In order to combat the trend Merchant’s Quay Ireland has commissioned research into the trend and it will soon release a report on the subject. The study is to be the first of its kind in Ireland, and Mr Geoghegan hopes that it will open doors into the area. MQI’s needle exchange program is the largest in the city and the only place that users can access clean needles all day, everyday.